Sudden and rapid perturbations of the long-term carbon cycle can bring about changes requiring the direct use of non-steady-state modeling. Some examples are the effect on the level of atmospheric CO2 and oceanic 813C of instant decarbonation of limestones accompanying extraterrestrial bolide impacts (Caldeira and Rampino, 1990; Kump, 1991; Beerling et al., 2002), degassing of CO2 accompanying massive volcanic eruptions (Dessert et al., 2001), and degassing of CH4 from the decomposition of methane hydrates followed immediately by oxidation of CH4 to CO2 (e.g., Dickens, 1997; Beerling and Berner, 2002; Berner, 2002). Sudden perturbation of the steady-state carbon cycle normally takes about 500,000 years to return to a new steady state (Sundquist, 1991). Over such a "short" time, more slowly varying processes can be ignored, including changes in the position, size, relief, and exposed lithology of land areas. This is equivalent to holding fD(t), fA(t), fR(t), and fL(t) constant. Degassing parameters, such as fG(t), fC(t), which also change only very slowly, are ignored and replaced by jumps in Fmc(t) and Fmg(t) that are either instantaneous (bolide impacts) or occur by square wave or Gaussian input functions over periods of thousands to tens of thousands of years (methane hydrate degassing) to a few hundred thousand years (volcanic degassing). 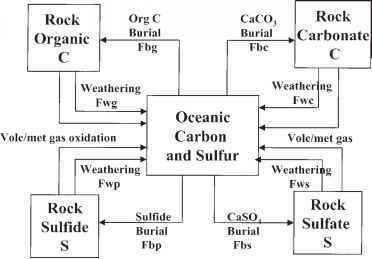 Also, the surficial reservoir is divided into its components, and separate carbon mass-balance expressions are used for the oceans, atmosphere, and biosphere. In other words, short-term carbon cycling is mixed with long-term cycling. Furthermore, where carbonate precipitation is involved, mass balance expressions for Ca, Mg, and alkalinity are included.